Hi! My name is Madison and I adore working with children. I have tons of experience and people only have good things to say about me working with their children. I have been working as a swim instructor for younger children and a lifeguard for 3 years. I am CPR and first aide certified. I have babysit children as young as 1 years old. 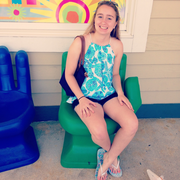 I have worked as a preschool assistant and currently am studying early childhood education at Towson University. I am a patient, kind-hearted individual and I hope you get to see this! Madison doesn't have any reviews yet.